Teaching Youth Baseball, in my opinion, is possibly more complex and difficult than training major league ball players. If you actually stop and think about it, as a MLB Coach, you have a pitcher you are attempting to teach how to throw a new pitch, if need be you can dedicate 24 hours a day, 7 days a week coaching that One item. Now imagine the little league coach who has a group of 8 year old players who want to pitch, but haven’t been taught the basic mechanics of throwing, much alone pitching. I stress this issue because I never want anyone to ever under estimate or not appreciate the importance and the difficulty Youth Baseball Coaches take on in order to teach our kids the game of baseball. On the subject of teaching basics, let’s learn some Basics of Playing the Infield Corner Positions, including strategies and actually logistics. (1.) 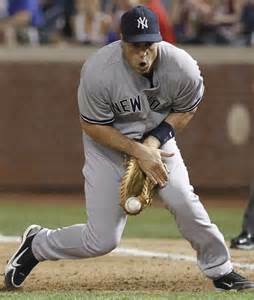 The first thing you need know is where a first baseman plays and that, as with all defensive positions, will alter with the situation. 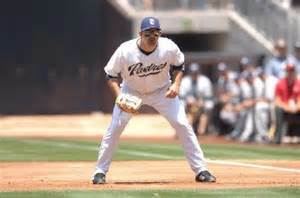 The normal beginning position of the First Baseman, with no runners on base, is approximately 15 to 20 feet behind first base and approximately 10 to 20 feet away from the foul line towards second base. This starting position allows you to field your portion of the right side of the infield, and still offers plenty of time to get to first base to receive a throw from another fielder. (2.) Now that you have your normal playing location, let’s exam the steps of getting into your normal fielding position. (a.) Your weight should be on the balls of your feet, never stand flat footed, slightly bent forward, hands held waist high as the pitcher begins his windup. (b.) As you follow the pitch to the plate you will be moving your feet by creeping forward, which begins to lower your body, putting your glove closer to the ground, and will enable you to move quicker in any direction, in comparison to standing still. This is your standard fielding position on Every Pitch, even with runners on, except you’ll have to get your body into this fielding position faster. When a batter gets to first base safely, whether by hit, walk or being hit with the pitch, you now have the added responsibility of helping your pitcher keep the runner close to first base, preventing him from stealing second base, or advancing to third base on a base hit. Let’s learn how to do this. (1.) Place the outside portion of your right foot against the edge of the first base bag, while at the same time extending your glove out as a target for the pitcher to throw to in a pick off attempt. It’s important to know pitchers are taught to throw to a target, therefore displaying a stable target, about knee high is required. (2.) When the pitcher throws over, as you catch the ball maintain the ball’s motion, by using a quick swipe tag, where you continue moving your glove backwards towards the dirt in front of the second base side of the bag. 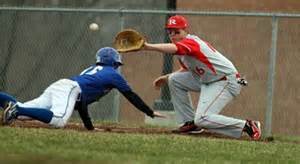 The runner, especially if it’s a close play, will be diving back in head first, hands extended, and a high tag will miss him, it must be low, allow the runner to slide into the tag. (3.) Pitchers will often throw over to first base not utilizing their quickest pick off motion, in order to fool the runner, and set up a Quick pick off move. They will also throw over to let the runner know he’s being intensely watched, making getting a good lead off and jump off first to steal second more difficult. The pitcher is attempting to play the runner, either lulling him to sleep into thinking the pitcher’s move to first is easy to beat, or is purposely trying to scare him in order to keep close to the base. It’s important for you to remain alert and not be fooled by the things the pitcher is attempting to do with the runner. A quick tip here: When applying a swipe tag be sure the ball is secure in the glove or You run the risk of slinging it out of your glove into foul territory and allowing the runner to advance. 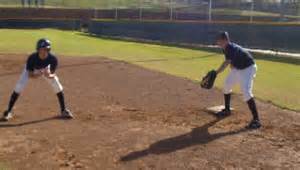 Your job of holding the runner close to the base is critical, but You are first and foremost an infielder responsible for fielding hit balls, so you must be able to get off the base and into your normal fielding position quickly. Let’s learn how to do this. (1.) You and the runner on first have one thing in common, exactly the same as the runner, you are looking for the point of no return, when the pitcher commits to throwing home, as this is your time to immediately move into your fielding position. (2.) You move to the position, either straight away from the base, or at a slight backwards angle, by taking quick shuffle steps sideways, which allow you to quickly change direction if required, because your feet are close to the ground and you are square to the batter. Never cross one foot over the other when moving to your fielding position, as it eliminates any chance of reversing directions in the event the ball is hit behind you, your left side. Some first basemen appear to feel they are only responsible for receiving throws from other fielders or keeping a runner close to the base, and aren’t responsible for much more. Nothing could be further from the truth, you’re an infielder and as with All infielders, you are responsible for fielding any ball you can reach. Let’s learn how to field to our right. (1.) Field every ball to your right you can reach, and after fielding the ball, always try to take the out yourself by outrunning the runner to first base, as it eliminates a throw, which eliminates an opportunity for an error. (a.) When running to the base, always try to hold the baseball in your bare hand, not the glove. You have a better grip on the ball, not worrying about jarring it coming out of the glove, and you’re ready to toss to the pitcher if need be. (2.) There will of course be many times that after fielding the ball you’ll be too far from first base to out run the hitter, and you’ll have to throw the ball to the pitcher, who will be covering first base. (a.) On a ball fielded far to your right, after catching the ball regain your balance by planting your right foot and push off, throwing over handed, a chest high strike to the pitcher. This requires practice because timing is involved between the ball and the pitcher. (b.) Distance dictates the velocity of your throw, as you wouldn’t throw a rocket if you were only 15 feet away, but may need to from 30 feet. (c.) If you’re reasonably close to the base, but the pitcher is closer or already there, use an underhanded shuffle throw to him, again chest high. There’s no need to get involved in a foot race with the runner, throw to the easy out. After throwing the ball to the pitcher, if there are other runners on base, it’s your job to inform the pitcher what to immediately do, as he’ll be facing away from the field of play. The first baseman beginning a double play involves somewhat tricky foot work and split second decision making, but can be mastered with practice. Let’s learn how. (1.) When a ground ball is hit to you, after fielding the ball, you’ll have to quickly shift your feet, which also involves turning your hips to face second base, throw a chest high strike to whoever is covering second base, most likely the shortstop. Here’s an important issue, you must have a clear throwing lane to the base which will not risk the ball hit the runner. Should the runner be in the line of sight, you must step forward or backwards in order to open a clear throwing lane. 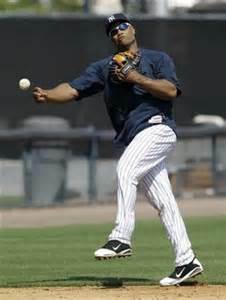 Remember, you should not throw the ball over the runner’s head because the fielder will temporarily lose sight of the ball as it approaches and passes over the runner, which is not good for making the catch. (A.) Should there be no fielder already covering second base and awaiting your throw, that’s not suppose to happen, but let’s get real … bad things happen, you must immediately decide what to do. (a.) If the runner is slow or quite a distance away from the base, wait for the fielder to get to the base, or nearly to the base, before throwing. (b.) Seeing the infielder quickly approaching the base, try to throw the ball, called leading, directly over the base and chest high. This places the ball in the best fielding level of the moving infielder and he’s moving to the base. After throwing to second, always try to get back to first base for a return throw, although the pitcher has the responsibility of covering first base if you were too far out of position, being a back up is the prudent thing to do. Cardinal Rule: Always Get One Out ! If you bobble the ball, don’t think your throw can beat the runner to second, the infielder is too slow to the base, anything which puts you in doubt you can get the lead runner out at second base … go to first base for the sure out, while watching the runner in case he tries to advance to third base. (3.) Always Have In Mind to Throwing the Lead Runner Out ! By having this pre-programmed mindset there will be no hesitation of throwing to second base, because the slightest pause on your part, could result in the runner being safe. Instinct and practice will tell you when to go to first base instead.